I'll confess. I use my bread machine a lot more than most folks would imagine. As much as I love the process of making bread, I don't always have time, and there are days when there are so many other things going on in the kitchen that there's just no way to find an unused swath of kitchen counter space to make the process pleasant. I have a few basic recipes that I know will work, and I even wrote some recipes a bread machine (this Gourmia bread machine ), so I'm comfortable with creating recipes. But the one thing I learned from my long association with bread machines is that not every traditional bread recipe will work in a bread machine. But sometimes I throw caution to the wind, like with this recipe from a cookbook. Once again I'm making recipes from a cookbook that's being passed around in a cookbook group I belong to. 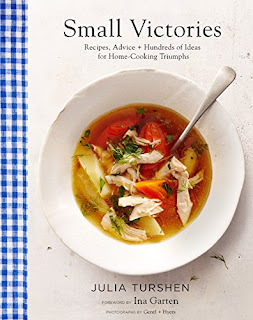 The book is Small Victories by Julia Turshen. The recipe, as written was for raspberry jam buns, but the last thing I needed was a batch of sweet buns. There were variations (called spin-offs in the book) for cinnamon rolls, garlic buns, herb goat cheese buns, monkey bread, salami or prosciutto bread, and buttery dinner rolls. I considered making the dinner rolls, but still didn't want to fuss that much, so I decided to just toss all the ingredients in the machine and let 'er rip. I didn't warm the milk, as the instructions said, and the butter was straight from the refrigerator rather than at room temperature. It all went in, as is. I used Red Star Platinum Yeast rather than regular active dry, but otherwise I used all the ingredients suggested. If you're using a different brand of active dry yeast than Red Star, you might need to soften the yeast in liquid before kneading since some of the active dry yeasts from other brands have a larger granule size that won't dissolve if it's put directly into the dough. If you use Platinum, Red Star Active Dry or any rapid or bread machine yeast, you don't need to soften the yeast before proceeding. Toss it all in the bread machine. I'd suggest cutting the butter into at least 4 pieces so it kneads into the dough easier. If you don't have Platinum yeast, that's fine - just use whatever yeast you like to use in your bread machine. I used the basic bread setting, 2 1/2 pound loaf, and a medium crust. When I make this again, I'll use a light crust setting so the crust doesn't get quite as dark on the bottom and sides. It wasn't bad, and it wasn't burned, but is was a little darker and thicker that it needed to be. And that's it. Set the machine, wait until it's done, and remove the loaf when it's done.